Note: After encountering some bugs in the X10, we contacted Sony Ericsson. The company said that the review unit we had received was running preproduction software that will be updated before the X10 goes on sale. We'll update the review and give the X10 a rating once we get a unit equipped the final version of the operating system. 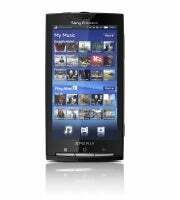 By now, most Android fans have seen the videos of the Sony Ericsson Xperia X10 and its silky user interface. Likewise its exciting specs (which include a 4-inch display, a Snapdragon processor, and an 8.1-megapixel camera) are widely known. But does it live up to the resulting high expectations? After spending some time with the Xperia X10, I have mixed feelings. Though I loved the phone's hardware, the software was buggy and slow at times. And faced with shortcomings such as the absence of multitouch and the omission of an Android 2.0 (Éclair) upgrade, I can't recommend the X10 over other high-end Android phones, like the Motorola Droid and the Google Nexus One. The X10's design unmistakably marks the smartphone as a Sony: Like its sibling, the Windows Mobile-based Xperia X1, this handset has an eye-catching sleek profile, an elegant curved body, and a minimalist black-and-chrome color scheme. Measuring 4.7 by 2.5 by 0.5 inches, the X10 is slightly larger than most smartphones (the Nexus One, for instance, measures 4.5 by 2.4 by 0.5 inches) and feels slightly awkward to hold. It weighs a manageable 4.8 ounces. The reason the X10 is larger than average is to accommodate its 4-inch, 480-by-854-pixel WVGA display, which is bigger than the displays on the Nexus One (3.7 inches), the Droid (3.7 inches), and the iPhone 3GS (3.5 inches). Despite its gorgeousness, the display wasn't always as responsive as I would have liked. For example, to unlock the phone, you drag the "lock" upward; but frustratingly, I sometimes had to swipe a couple of times to get it to unlock. Like Motorola and HTC, Sony Ericsson developed its own proprietary user interface (which it calls UX, for User eXperience--also code-named "Rachael") to run over Android. Sony Ericsson announced before Mobile World Congress that both the X10 and its younger sibling, the X10 Mini, will initially ship with Android OS version 1.6, but the operating system will eventually be upgradable. You can read the company's full explanation at the Sony Ericsson Product Blog. Fortunately, UX delivers some useful enhancements to Android 1.6. Similar to Motorola's Happenings widget on MotoBlur, the UX's Timescape application manages communication with contacts across e-mail accounts and social networks. But instead of presenting your contact history in a boring list, Timescape displays your update history in something called "Splines"--essentially a 3D stack of cards featuring your friends' updates. Visually, I liked Timescape, but I felt as though it tried to do too much at once. Not only did it take a while to load (see the "Performance" section below), but I felt a bit overwhelmed with information. To manage your music and videos, UX offers a smart feature called Mediascape, a welcome change from Android's boring out-of-the-box media player. When you first open it up, Mediascape shows you your most recently played tracks and your favorite tracks. It also integrates Sony's PlayNow store for purchasing tracks. I couldn't test the store, though, because as yet there's no U.S. support for it. Mediascape nicely displays album art, and it offers various browsing and playback modes. UX also supports Face Recognition technology. This feature is pretty cool in theory: You snap a picture of your friend, tag it, and let UX store it. The next time you snap a picture of that same friend, UX will recognize the person's face and automatically tag it for you. The feature also lets you call someone by tapping on their face when viewing a picture. Unfortunately, I couldn't get Face Recognition to work. I tried it on a couple of different people--including myself--but UX never remembered who was who. When I informed Sony Ericsson reps that the feature wasn't working, they assured me that it should be functioning. I don't know whether the issue was unique to my test unit or whether the technology simply isn't as "smart" as I want it to be. I intend to keep playing with Face Recognition, but at this point I haven't had any luck with it. The Face Recognition bugs aside, the X10's 8.1-megapixel camera with LED flash is a winner. The intuitive interface comes with a handful of useful features such as touch-to-focus and smile detection. Recent photos appear at the bottom of the screen so you can easily review and delete them. The X10 truly shines at Web browsing, thanks to its speedy 1GHz Snapdragon processor. Media-rich Web pages loaded quickly over AT&T's 3G network. Smooth scrolling and the 4-inch display combine to put the X10 on a par with the iPhone 3GS and the Nexus One for surfing the Web. But here again, I must lament the lack of multitouch: While double-tapping to zoom worked fine, pinching-to-zoom on a display of this size would have been even better. Performance, unfortunately, wasn't consistently speedy. Despite its beefy processor, the X10 stuttered through a few menus. Scrolling through Timescape, for example, was sometimes excruciatingly slow. In addition, launching certain applications took a bit more time than I expected. Call quality over AT&T's 3G network was good in San Francisco, but it got noticeably worse when I traveled over the San Francisco Bay Bridge to Oakland. Whereas my contacts' voices were loud and clear in San Francisco, they sounded faint in Oakland--and I experienced one dropped call. I suspect that these issues are the fault of the network and not of the phone, however. In the absence of an announced price or a final version of the included software, I'm hesitant to give the X10 a bottom-line assessment or to predict how it will fare against other high-end Android devices, like the Google Nexus One. At the very least, I hope that Sony Ericsson fixes the phone's sluggishness and its nonfunctioning Face Recognition feature by the time the company launches the new model. And though an update to Android 2.0 seems impossible before the X10 goes on sale, Sony Ericsson should give customers a confirmed upgrade date. Last, Sony Ericsson should price the X10 competitively with the unlocked Nexus One. The Xperia X10 has a lot of features I like, but I can't recommend it until Sony Ericsson addresses the issues I've identified.